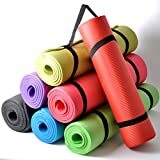 TNP Accessories Thick Yoga Mat is extremely thick and made of soft, cushiony NBR foam with a smooth texture surface. This mat is designed for Pilates or Boot camp workouts that require extra cushioning. It’s thick enough to provide comfort during your tough workouts, but firm enough to provide a stable platform. When you’re ready to pack up, this Pilates Yoga Mat is self – contained with two built-in velcro straps. This entry was posted in Fitness Products and tagged 16mm, 182cm, 60cm, Blue, Cushioned, Dark, Pilates, Thick, Yoga by Summer 365. Bookmark the permalink.